Cryptomyzus ribis apterae on their primary host are whitish to pale green or yellowish often with a greenish median stripe. The antennae are about 1.2 times the body length, and the terminal process is 9.0-11.5 times the length of the base of antennal segment VI. 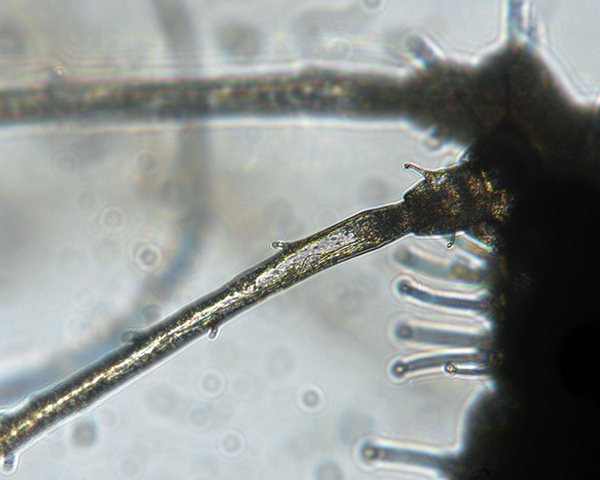 The longest hair on antennal segment III is much shorter than the longest hair on the inner side of antennal segment I (see second micrograph below). Their dorsal hairs are thick and capitate. The siphunculi of Cryptomyzus ribis are more or less cylindrical (cf. Cryptomyzus korschelti which has the siphunculi distinctly swollen on the distal half). On their primary host the siphunculi are about 3-4 times the length of the cauda, but on the secondary host they are usually shorter relative to the length of the cauda (2.4 - 3.1 times). 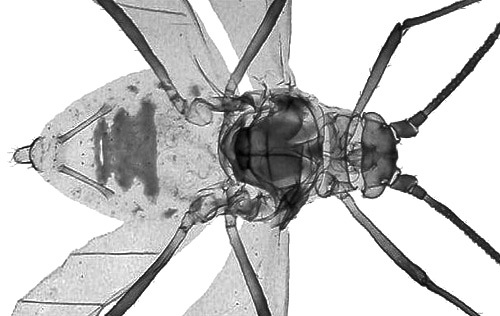 The body length of Cryptomyzus ribis apterae is 1.6-2.3 mm. The alate Cryptomyzus ribis has a dorsal abdominal patch indented at the sides, and 31-47 secondary rhinaria on antennal segment III, 11-27 on segment IV and 1-10 on segment V. The micrographs below show (1) an adult aptera lateral view and (2) the hairs on antennal segments I-III. The clarified slide mounts below are of adult viviparous female Cryptomyzus ribis (on primary host) : wingless, and winged. 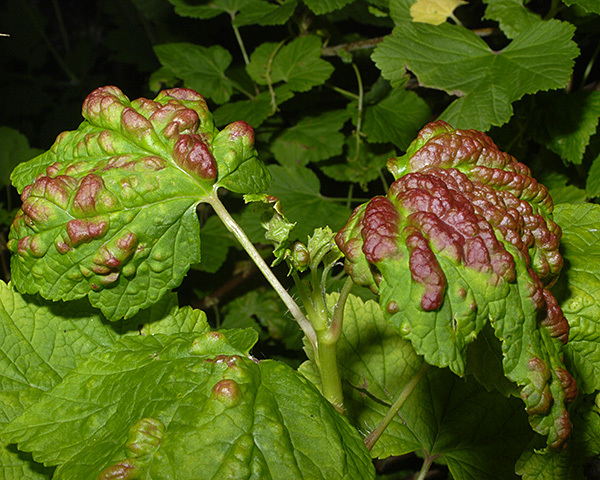 The redcurrant aphid host alternates between redcurrant (Ribes rubrum) and woundworts (Stachys species). Raised leaf galls are produced on Ribes (see picture above) which are broadly open on the underside where the aphids live. The upperside of the gall turns bright red. 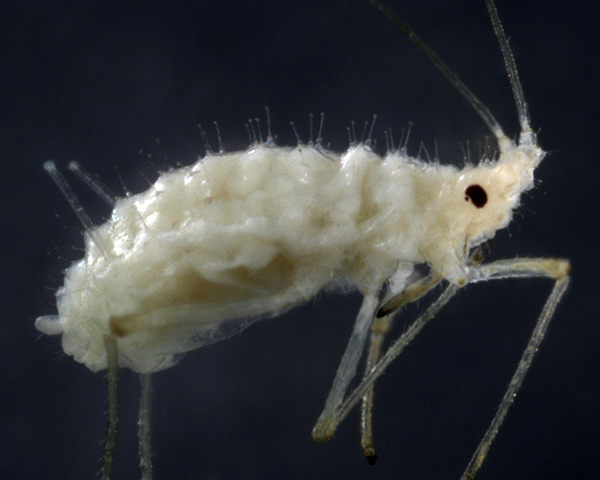 Cryptomyzus ribis are found throughout Europe, Asia and North America, and can be a serious pest of currant bushes. Cryptomyzus ribis has been recorded from 26 Ribes species. Blackman & Eastop list 18 species of aphid as feeding on redcurrant (Ribes rubrum) worldwide, and provide formal identification keys. 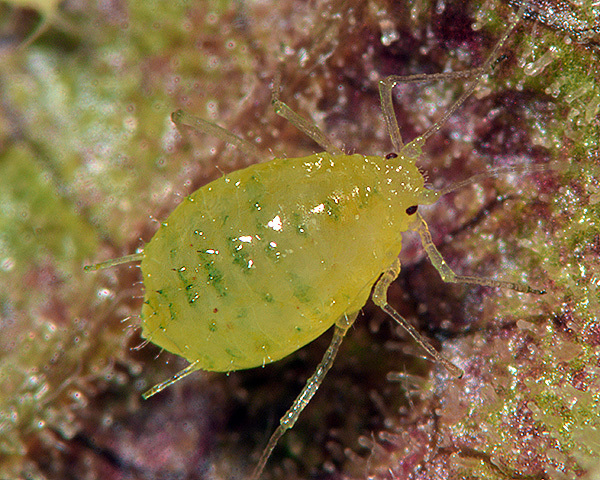 Of those aphid species, Baker (2015) lists 15 as occurring in Britain: Aphis fabae, Aphis grossulariae, Aphis schneideri, Aphis triglochinis, Cryptomyzus galeopsidis, Cryptomyzus galeopsidis ssp. citrinus, Cryptomyzus maudamanti, Cryptomyzus ribis, Eriosoma grossulariae, Eriosoma ulmi, Hyperomyzus lactucae, Hyperomyzus pallidus, Hyperomyzus rhinanthi, Nasonovia ribisnigri and Rhopalosiphoninus ribesinus. Blackman & Eastop list 22 species of aphid as feeding on blackcurrant (Ribes nigrum) worldwide, and provide formal identification keys. Of those aphid species, Baker (2015) lists 16 as occurring in Britain: Aphis fabae, Aphis grossulariae, Aphis oenotherae, Aphis schneideri, Aphis triglochinis, Cryptomyzus galeopsidis, Cryptomyzus galeopsidis ssp. citrinus, Cryptomyzus galeopsidis ssp. dickeri, Cryptomyzus ribis, Eriosoma ulmi, Hyperomyzus lactucae, Hyperomyzus pallidus, Hyperomyzus rhinanthi, Nasonovia houghtonensis ssp. similis, Nasonovia ribisnigri and Rhopalosiphoninus ribesinus. Blackman & Eastop list 21 species of aphid as feeding on gooseberry (Ribes uva-crispa) worldwide, and provide formal identification keys. Cryptomyzus ribis has been recorded from 11 Stachys species. Blackman & Eastop list 7 species of aphid as feeding on hedge woundwort (Stachys sylvatica) worldwide, and provide formal identification keys. 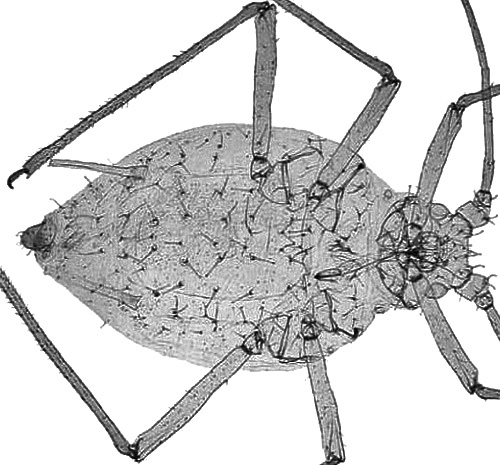 Of those aphid species, Baker (2015) lists 4 as occurring in Britain: Aulacorthum solani, Cryptomyzus galeopsidis, Cryptomyzus korschelti and Cryptomyzus ribis. We also thank Plumpton College and the staff at Plumpton College at Stanmer Park for their kind assistance, and permission to sample.